Panjab: the Maharajah Dhulip Sing. bl.uk > Online Gallery Home	> Online exhibitions	> Asia, Pacific and Africa Collections	> Panjab: the Maharajah Dhulip Sing. 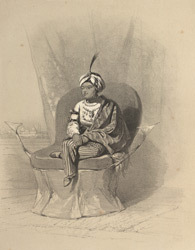 Plate 1 from "Recollections of India. Part 1. British India and the Punjab" by James Duffield Harding (1797-1863) after Charles Stewart Hardinge (1822-1894), the eldest son of the first Viscount Hardinge, the Governor General. This depicts Maharajah Duleep Singh (1837-1893). Duleep was the son of Maharajah Ranjit Singh, the powerful 'Lion of Lahore', who controlled the Punjab for nearly 50 years. After Ranjit's death in 1839, assassinations and struggles for power prevailed, but Duleep was finally proclaimed Maharaja in 1843. In 1849 the British annexed the Punjab and Duleep was forced to renounce his sovereign rights. He was exiled to Futteghur and upon becoming a Christian was brought to England in 1853. Having an interest in Indian princes, Queen Victoria received the handsome and studious youth, whom she took under her wing. In 1863 the Maharaja bought the 17,000 acre Elveden estate in Norfolk, near Thetford.